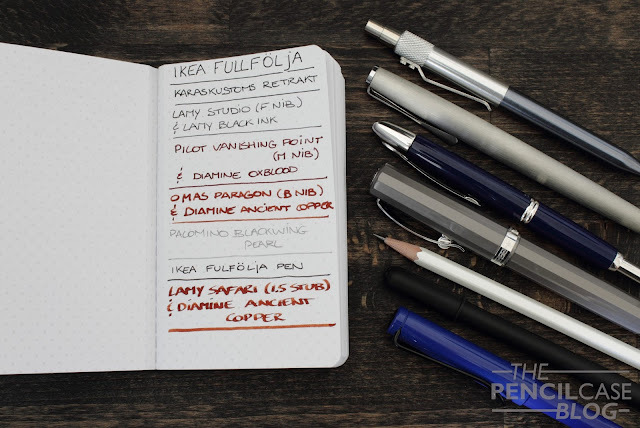 The second Ikea stationery item I wanted to talk about, are these tiny Fullfolja notebooks. 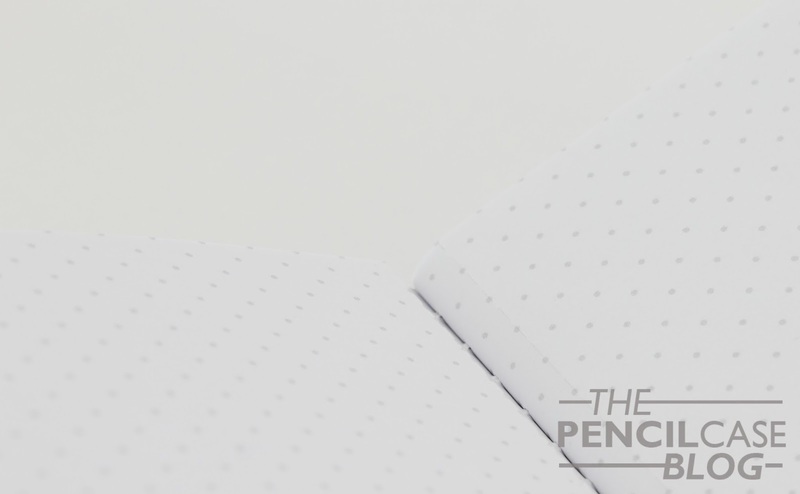 This pocketable notebook comes from the same product line as the rollerballs I talked about previously. The design of the Fullfolja notebook is simple, as we have come to expect from the swedish furniture company. The color scheme is subtle, white glossy cardboard stock with grey dot pattern on the outside, similar to the dot-paper inside. The notebook is kept closed by a grey elastic band that is attached to the back. This is basically the only 'flaw' I could find, as it makes the notebook lay down slightly unstable due to the added bulk of the elastic band. Other than that, I actually quite like the design, it's simple, not luxurious or anything, but that's something I can live with given the price point. As I mentioned above, these notebooks are really small. 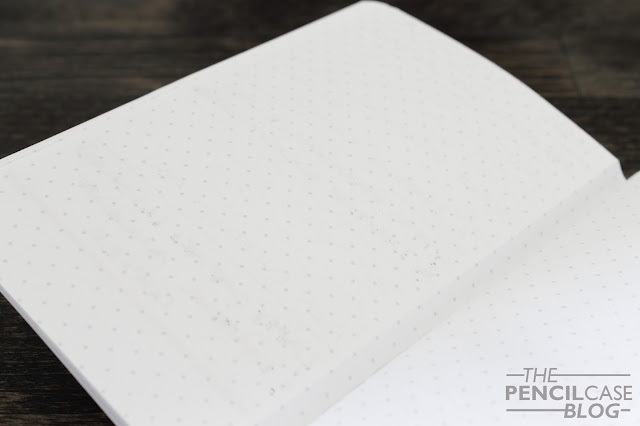 Compared to a Field notes -already a pocket-sized notebook- they are still noticeably narrower and less tall (exact dimensions are 5 x 4 1/4 Inch). It is, on the other hand, slightly thicker than a Field notes, due to the much higher pagecount and heavier paper (100 pages of 80gsm paper compared to 48 pages of approx. 50gsm paper on the FN) The heavier paper on the Ikea notebook is already quite a good sign for fountain pen users, as heavier paper tends to mean less bleedthrough. 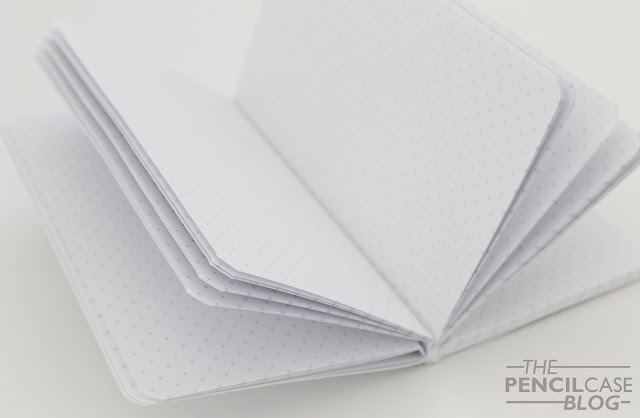 The white pages are marked with grey dots in a diamond pattern. The dot layout is interesting, and it takes some getting used to, but it's still nice to use. A neat little extra: all 50 sheets are perforated, so you can remove a page without messing up the complete notebook. In use, the paper really is quite great. It literally outperforms notebooks that cost ten times as much! The relatively heavy paper kept up with even the 'heaviest' fountain pens I could throw at it, such as my Omas Paragon Broad nib, or Lamy Safari 1.5 stub. 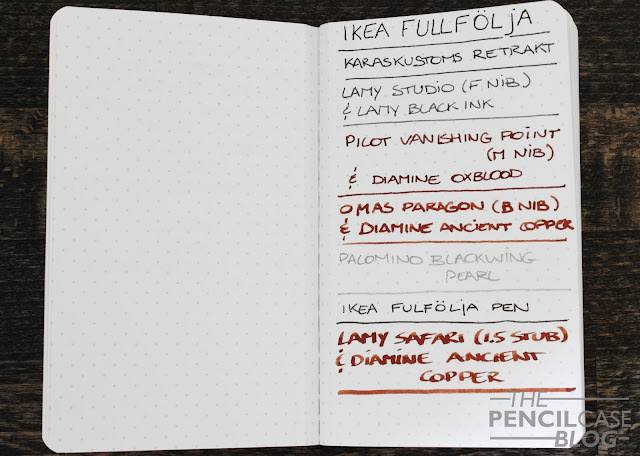 It didn't feather, and showthrough/ bleedthrough was very minimal (the backside of the page was still perfectly usable). Once again, Ikea managed to surprise me. This 0.75 EUR / 1 USD notebook managed to perform as good as a 20 dollar notebook, or even better! 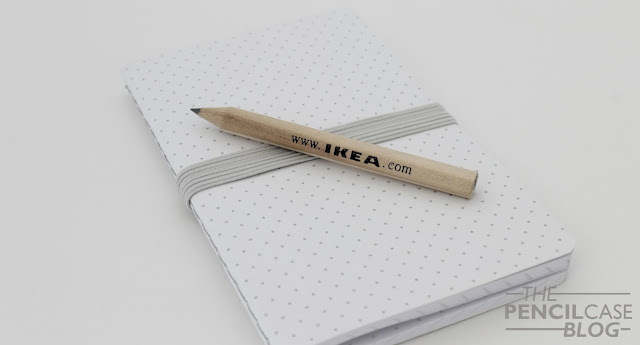 Next time you go shopping at Ikea, make sure you grab a few of these! That is a good tip, thanks! Next time I'm in IKEA I shall take a few home.